Totternhoe defeated second placed Mursley United 2-1 at the weekend to maintain their hopes of a top two finish this term. On a difficult pitch, the hosts raced into the lead after just 10 minutes when Joel McCormick latched on to a defensive mistake and coolly rounded the keeper score. It was 2-0 eight minutes later as Aidan Murray’s diagonal pass found Chris Golding in the box and he unselfishly squared the ball to Andy Cleere to tap into the empty net. Mursley pulled a goal back five minutes before the break when a teasing Adam Bone free kick fell to Lewis Delahaye who stabbed home from six yards. The second half was a drab affair with Mursley having the better of the half, their best chances coming when Louis Bowley produced a superb save from Delahaye with 10 minutes to go. Afterwards, boss Chris Robson said: “It was a real poor game, very boring infact. For us it was as bad as we have been all season. “We lacked any real urgency and certainly lacked quality. 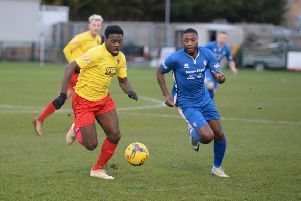 “I know Mursley have played many more games than the teams at the top and will probably finish around sixth or seventh, but if anyone was watchingand didn’t know any different, they wouldn’t believe that it was a top of the table clash. “Strong words were spoken after the game and we will now have to make sure we react and produce a performance we are capable of on Saturday when we travel to the unbeaten league leaders. “It is a game we must win if we are to keep any slim hope of winning the title alive”. Totts go into the game at Park View, 18 points behind the table-toppers with two games in hand. Totts: Bowley, Rimmer, Lauder, Dyer (Hibbitt), Murchie, Folland, Golding, Murray (Irons), Farmer McCormick, Cleere (Smith). Subs not used: O’Connor, Loasby.